Receive all the latest news! 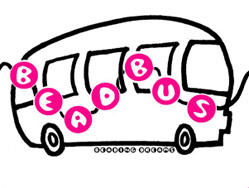 Let the Bead Bus bring the party to you! Birthday parties for kids ages 6 and up in the convenience of your own home or the venue of your choice! Check the Parties page for complete information! When you have a cabochon, crystal or undrilled stone, a little soldering goes a long way in creating a simple but beautiful setting that will allow your stone to shine. This hybrid setting method combines basic soldering with simple wire wrapping to create pendants for a variety of stone shapes. This class involves torches. Students must follow the Hot Class dress code and safety policy. Online registrations are not valid without payment. Please make sure that you complete checkout through PayPal or call (214) 366-1112 to pay by phone. Please be sure that you have read and agree to abide by our Class Policies before signing up. Online registration closes up to 24 hours before class time. Spaces may still be available in classes after that time; call (214) 366-1112 to find out and register!